Slippery tanks are not so fun. Tankgrip that you can make yourself. I got to wanting some way to grip the gastank on my 06 a little better. I checked out Stompgrip and Techwear. I looked at the skateboard style grip tape, and did not like the thought of destroying my expensive leathers on it. Well after thinking about it, I remember that at Walmart I saw some stuff made to stick on the tailgate of a truck or on running boards to give you better grip. 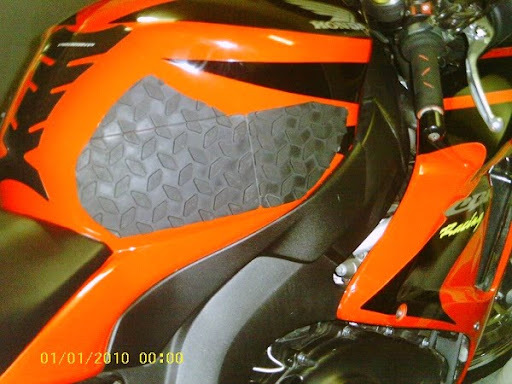 It is black rubber adhesive diamond plate. I went and picked some up for $8 in the automotive section where they have trailor hitches and ratchet straps. I cut it using scissors. I cut out all the pieces for one side, then I flipped them over and used them as a template to cut out the other side. Check out the picture and tell me what you think. Ignore the wonderful time and date stamp on this photo, had to borrow a camera mine got left on. It works nicely, I road about 70 miles today and had no issues with smashing in to the tank. You for sure have got to wear jeans at least with this stuff. I am not a shorts riding kind of guy so that is a non issue. One thing for sure that I like is that I did it in sections, so as it wears out I can replace sections as they wear. I like how it looks too, and that is important. I believe it added 10 horsepower and at least 5 pounds of torque. For $8 to make you feel this good how can you go wrong??? Frankly I think it's awesome and a hell of a lot better than spending $50. I went with the non abrasive grip strips on my bike and just might have to go this way instead. Curious if you could do a shot with the whole bike? good idea, but you prob. could have done just the main piece and it wouldn't look so big and still get the job done. It looks like you made it in 3 piece's, Not a bad idea at all tho. I can always take it off my tank, but in your case well..... I ride my bike everyday unless it rains all day so riding in my track suit is not possible everyday, I am just not that kind of guy. This is a cost effective highly expedient way of solving a common problem. I cut mine in the shape that I did because I actually ride my tires sidewall to side wall and found that I needed the grip to be strategically placed. It comes off easy with a heat gun. Just make sure you are wearing jeans because it will not be nice to your legs. At first it was a bit uncomfortable after extended riding periods, but in a short amount of time it became unoticable. I am able to keep my weight off of my arms and hands even more so with this on my tank, that allows me to maintain a silent upperbody during cornering which frees the front end up follow a smoother track and articulate freely. Last edited by Stu Pidasso; 09-19-2011 at 11:52 AM. Here is what my ride looks like with the tank grip installed. Someone said they would like to see how the grip affects the entire presentation. 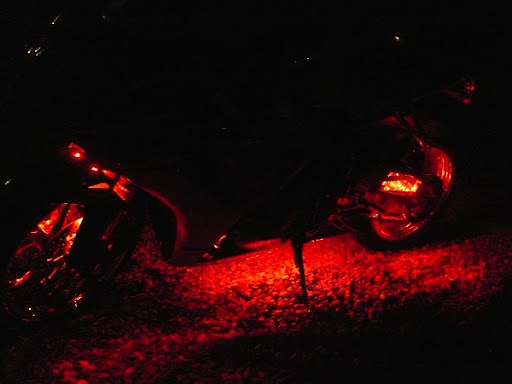 I also have another picture below of what my whip looks like at night. I made my own light kit because I did not like the options pre-manufactured kits have. I also did not care about a remote, flashing lights, or multiple colors; it is a motorcycle not a christmas tree and another remote that does not like being wet is of no use to me. Quick Reply: Slippery tanks are not so fun.